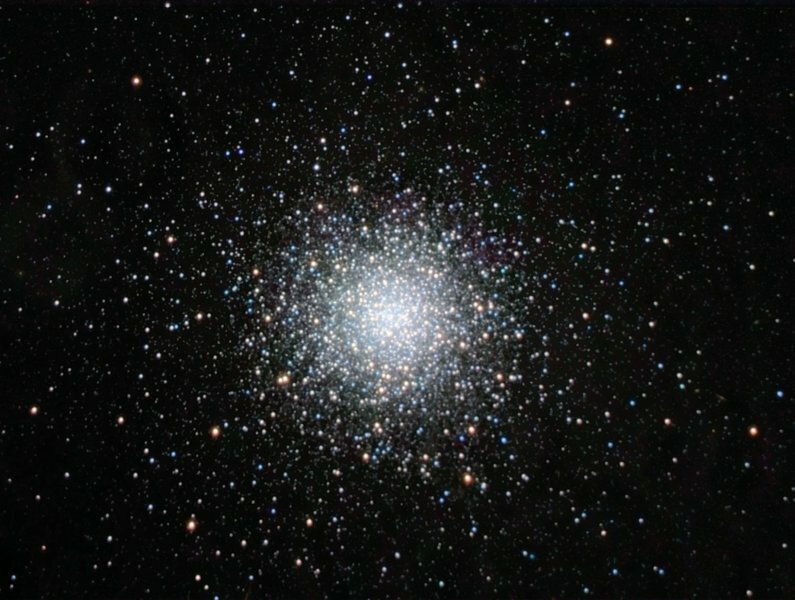 M3, the third entry in the famous Messier catalog of deep sky objects, is one of the best examples of globular clusters. It contains about a half million stars, and is famous for a large number of variable stars discovered within it. It has one of the densest core regions for a globular cluster, with 50% of its total mass within its central 22 light-years. This object is pleasing both photographically and visually, and can be observed with moderately-sized telescopes even from light-polluted locations. It lies in the constellation Canes Venatici, or the Hunting Dogs, which is better known for its galaxies. M3 is comparatively bright as far as deep space objects are concerned, and for this reason satisfying results can be obtained when shooting this with short exposures from light-polluted locations. Personal Notes: M3 is "accidentally" one of my most imaged objects. I imaged it in 2008, and when I took this most recent image I did so because I thought I it was another globular, M5, that I had imaged in 2008. M3 is also the first DSO I shot in color shortly after acquiring my color filter wheel. From 2004.. This was my first ever RGB shot after getting a color filter wheel and filters. Takahashi FS-102 on a Takahashi EM200 Temma-II mount. Camera was an SBIG ST-7E with Custom-Scientific LRGB filters. Acquired in West Chester, Ohio. From 2008.. Takahashi FSQ-106N operating at f/8 with an Extender-Q on an Astro-Physics AP1200GTO mount. Camera was an SBIG ST-10XMEI with 5-position filter wheel and Astrodon LRGB filters. Externally guided with a Borg 45ED and Meade DSI Pro. Acquired in West Chester, Ohio.